In Shamanism, the skill of Shapeshifting is quite literal. Medicine Men and Women, so in league with their Spirit Allies and Totem could seem to change form. Scouts and hunters could also become invisible and blend into the environment to avoid detection by their prey or their enemies. Grandfather Nicholas Black, Crazy Horse and others were masters of the Ghost Dance, becoming invincible in battle and times of need, as they would slip into their Spirit form and become cloaked to those bound by time and space. Masters of the Far East can wormhole and bi-locate from city to city in the blink of an eye. These are just some of the skills of the Shafeshifter that can be adapted to modern life, and brought into new dimensions of expression. To some people these types of skills seem unreal, too fantastical and out of the ordinary. Perhaps mostly because humanity as a whole has been taken inward, and these skills as brought to us through the indigenous cultures were grounded in the physical, though fantastic they may be. But there are other ways that the skills of Shapeshifting can transform, enrich and empower our lives. For example, if you wrote a book, created a website or produced a podcast, you would essentially be bi-locating... potentially hundreds and millions of times... as many others would be reading your words, hearing your voice, viewing your art or your music, connecting with your energy at the same time. The high vibration of technology has bent down the Tree of Life... making the art of Shapeshifting available to us all! One of the most powerful ways to embrace the Shapeshifter is through journeying and astral travel. As we bring back powerful visions, even snippets of information from these realms can be a catalyst for tremendous change. It is like bringing a tweak into the blueprint of your life from the source level. This opens up channels and doorways for miraculous change, that can look like new health habits, a desire to eat more nutrient rich foods, to get out more in nature, to walk on the earth and roam, to travel to other parts of the world, to create from your heart, to open your heart to more love, a new career or a new attitude.. to do what you could not or would not let yourself do. Any one of these things can start the process of Shapeshifting into our lives... from a change in our body, to a change of address... to a change of career! "It's not what you are looking at, it's what do you see?" "The Shamanic art of Shapeshifting involves the use of the spirit or body of an animal to protect, to heal, to cure, to teach, or in some way to benefit others. Other perspectives on shapeshifters include merging with our spirit totem, animal spirit, or "non-human" spirit self in order to do some "work" that we cannot do in human form. Some healers put away the limits of their human self and step into their formless or shapeless selves. This is more of a way to move into the most sacred aspects of "self" in order to release "ego" to divine will. Shape shifting is alive and well today, right here in our own society. You don't believe it? Well, the next time you are going somewhere, look in the mirror. Are you not putting your best foot forward before stepping outside? Few words are more exciting in American Indian culture than Shapeshifter. Both mysterious and illusive, the mind is challenged to know more about this phenomenon which has occurred through all the tribes in America. Shape shifting touches the very soul of the Indian. Brothers in nature, it is quite natural for him to feel as one with the spirit animal sounds in his chanting, just as he feels Earth Mother's heartbeat in his drumming. In the dance, he wears feathers or the skin of his animal guardian, while his movements take on the grace and form of the eagle, wolf, bear, etc., whichever one he himself has become. The dance is shape shifting in its most eloquent form. In some tribes, shamans use shape shifting in a more serious manner. Wearing feathers, or the hide of his guardian spirit, the shaman would perform the animal's actions to imbue its healing powers in both himself and the patient. Belief in the healer and his shape shifting often could mean the difference between life or death. So convincing were the shaman's performances, that sometimes an enemy would go out into the woods and kill the shaman's totem animal in the belief that he might be killing the shaman himself while he was in animal form. A form of shape shifting had a role in hunting. To hone this skill, in days gone by, the boy Indian would choose an animal to study. It was usually the wolf, noted for its cunning and survival skills. For as many as two years, the boy would devote time each day to be alone, near the wolf, observing its ways. In time, he learned to imitate its ways, and understood its thinking so well he could become the wolf himself. So close was this relationship between animal and man that early settlers came to believe that Indians actually were part wolf and killed them as they would the animal itself. The shadow side of the ShapeShifter occurs when we do not understand the positive uses and the reality of shapeshifting itself. When we do not allow ourselves to change and grow, to take a new form, both physically and metaphorically speaking we stunt our growth. We remain locked into the status quo... and our soul must come stalking us. We can use our ShapeShifting abilities to truly affect change in our lives. I will help you move that energy. I will help you take that dimensional leap. I will help you uplevel your life. But first you must ask me with your free will. I am not a replacement for the essence of who you are. I am here to serve your soul, to help you accomplish your mission, to deliver power, medicine and energy so that you can become the fullest version of your highest Self. You are of the Blue Ray, and you come forth through this channel and through your own ancient memories with the Star Knowledge of Sirius. This knowledge involves your latent skills of ShapeShifting and morphogenesis. The truth is that you are already a master at this. It's how you got here on earth. But as a Blue Ray, or Blue Star person you carry special encoding, that is not only to be used for your own personal benefit. In fact, barely have you been able to do so for yourself, and your directives urge you to consider the whole before you consider your own needs. But you have turned a corner in your evolution, even as Blue Star people of the Earth. Enough of you have come online, have come out of stasis that you remember who you are. 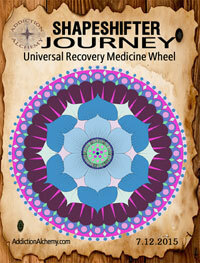 You are remembering that you are like the imaginal cells of humanity and carry within you the blueprint for Shamballa. You are here to download the memory of Paradise, the Garden of Eden, and restore that memory here on earth, into the physical reality. You are among the first to pass through the flaming cherubim and re-enter the garden. For a while, some of you have lived at the edge of the Garden just inside the gate. But as more of you come through, there is now a desire to move deeper into the Garden. It is important that you go all the way in now. Of course you did not want to go all the way in without your people. For entry into the garden would have been gained by your oneness, by your re-unification with the whole. You are reminded now to take that oneness truly to heart and know that when you allow yourself to become fully immersed in Shamballa consciousness, that you are not leaving anyone behind, that in fact you must embrace this to anchor it into the reality, so that others can, too! Now is the time. Continue to awaken... perfect health, creative flow, open hearted, honest communication, collaboration, socially conscious business, love and joy... community...a new standard of life here on earth is now possible. Let us go far, as we go together.